Images from LCROSS Visible Light Camera reveal a plume reaching 3.7 miles to 5 miles (6 km to 8 km) high just seconds after the spacecraft crashed into our moon. When a NASAspacecraft rammed into the moon in October, it tossed up a hard-to-see plume oflunar material. But theevent also stirred an observable cloud of public anxiety and protests in somequarters about ?bombing?the moon, a backlash that may hint at a rising ?Friends of the Moon?movement. On Oct. 9,the Lunar CRater Observing and Sensing Satellite (LCROSS) experiment createdtwin impacts on the moon?s surface in a search for water ice. Scientistsremain busy at work analyzing data to assess whether water ice was kicked-up bythe event. Given a human return to the moon, such a resource could help sustainfuture explorers there. Still, noteverybody was upbeat about beating up the moon. All thetalk about bombing the moon prompted science writer Pete Spotts of the ChristianScience Monitor to make his own nose-dive into Webster?s Dictionary to pinpointthe definition of ?bomb? ? ?an explosive device used to detonate under specificconditions.? Thatmeaning incited Spotts to scold reporters, chiding them to stop misusing andmisinterpreting the word in LCROSS mission coverage. Similar inview is NASA?s Jennifer Heldmann, lead for the LCROSS Observation Campaign atNASA?s Ames Research Center at Moffett Field, Calif.
?On LCROSSthere are no explosives?there?s no bomb. So we?re not bombing the Moon,? shetold SPACE.com prior to the crash. In reality, the moon is regularly hit with impactsthat release the sort of magnitude of energy as realized with LCROSS. So LCROSS wasn?tdoing anything new to the moon that doesn?t happen already, Heldmannemphasized, evidenced by its cratered appearance after being hit with objectsthe past 4 1/2 billion years or so. But othersfound unnerving aspects to the LCROSS slam dunk. In the HuffingtonPost, screenwriter Amy Ephron called it ?NASA?s own version of shock and awe?and put in motion a ?HelpSave the Moon? Twitter Page in the hope that readers ?can convince NASA not to try anyfurther experiments of this kind,? she wrote. ?Well, I for one, don?t likeexplosions. Call me a pacifist, call me cautious, call me an environmentalist,or call me something worse, I don?t really care,? Ephron explained. Others tooka less jocular view of NASA?s LCROSS effort. The ChicagoSurrealist Movement put its muscle behind a ?Stop NASA From Bombing the Moon?campaign. Thatcrusade called for ?Lunadarity forever!? and included a petition drive on Care2? billed as an online community of people making a difference in healthy andgreen living, human rights and animal welfare. Forexample, Care2 posted petitions embrace support for climate action to protectingpolar bears from global warming, as well as regulating toxic coal ash ashazardous waste. In thiscase, the moon petition tagged the NASA experiment as ?a hostile act ofaggression and a violent intrusion upon our closest and dearest celestialneighbor.? Furthermore,the appeal flagged the LCROSS mission as leading to ?the exploitation ofresources and the colonization of territory without regard for ecosystems orindigenous peoples, and clearly the moon is the next territory coveted byimperialists.? At lastlook, some 560 had responded to the anti-NASA bombing the moon petition, overhalf-way to a 1,000 person sign-up goal. ?There arereal issues related to lunar preservation and silly issues. The concern aboutLCROSS is in the latter category,? countered Chris McKay, a space scientist at NASA?sAmes Research Center in Moffett Field, Calif.
McKay saidthat impacts the size of the LCROSS crash are probably happening naturally onthe moon every few decades. ?A small crater in a crater saturated surface ishardly environmental destruction,? he told SPACE.com. But forMcKay there are serious issues still to be dealt with in terms of future utilizationof the moon. A plan tomine Helium 3 from the moon to power fusion energy plants that we don?t evenhave yet is one such issue, McKay said. Another is the preservation of NASA?ssix Apollo moon landing sites. McKay addedthat ?a real issue for scientists is the creation of a temporary atmosphere [onthe moon] due to rocket exhaust. I?ve seen estimates that it would take decadesto subside.? There is anupshot. McKay said he doesn?t think there are any serious biological issueswith either forward contamination or back contamination, so repeated travelback and forth between Earth and the moon shouldn?t pose too big a risk in thatrespect. ?Whetheryou agree or disagree with the protests about the LCROSS mission, it shows thatthe moon is perceived as a cultural place as well as a celestial body orbitingEarth,? said Beth Laura O?Leary of the Department of Sociology and Anthropologyat New Mexico State University in Las Cruces. ?The moon is seen as part of botha cultural and natural landscape that may be harmed.? O?Leary isco-editor of a new book ?Handbook of Space Engineering, Archaeology, and Heritage?recently issued by CRC Press. Inreviewing the feelings of those expressing LCROSS outrage, O?Leary said they sawthe mission as morally wrong. This is in contrast with previous perceptions,she told SPACE.com. ?The ideaof sending a spacecraft -- robotic or human piloted -- to the moon was viewedin the 1950s and 1960s as a legitimate scientific exploration, although it wasfirmly set in the context of the Cold War,? she said. ?The sentiment? is thatit is a bomb site not a crash site and that with the LCROSS mission we aredisturbing the natural order of the universe - from changing the tides tocommitting a sacrilege.? ?Some feelit is a violation of the United Nations Outer Space Treaty,? she added.? O?Learysaid that what is being expressed are some current sentiments which moveparallel to, but are in conflict with, the commercial interests in exploringand exploiting the Moon?s resources in the near future. 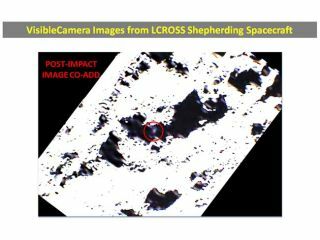 ?For spacearchaeologists, the material cultural and impact area of LCROSS on the moonexist as artifacts and features of an archaeological site. It is one of the fewrecently createdsites on the moon and is part of our space heritage,? O?Leary said. LCROSSjoins other lunar locales that are cultural resources on the moon, O?Learyadded. ?The event and the assemblage have many complex layers of meaningindicative of our human historical perspective about space in the 21stcentury,? she concluded.